Melatonin is often considered to be the body&apos;s natural pacemaker and plays an instrumental role in helping to regulate your body&apos;s internal clock. 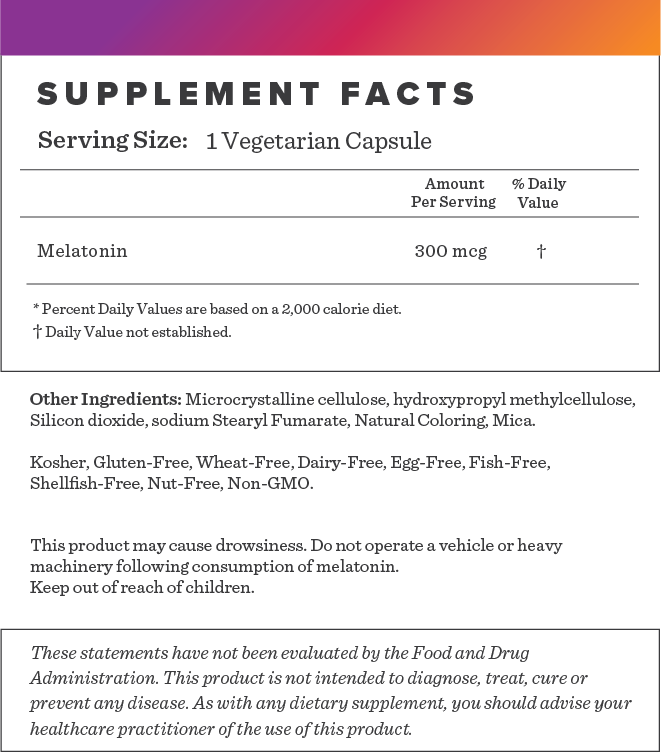 Melatonin is naturally regulated in the body, rising and falling during specific times of the day. 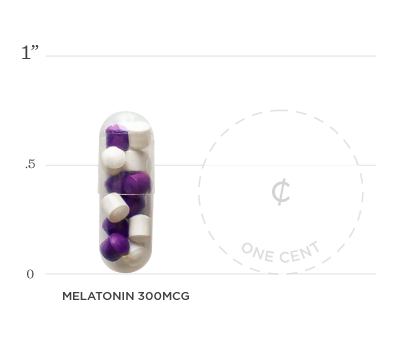 Melatonin production can be disrupted by many factors including an inconsistent sleep schedule. Our low-dose supplement supplies the body with its natural sleep hormone. Traveling, stress, and schedules can disturb sleep cycles. Leading research has shown that cycling melatonin may help reset the biological clock after disruption to get sleep patterns back on track. 1. Xie Z, Chen F, Li WA, et al. A review of sleep disorders and melatonin. Neurol Res. 2017;39(6):559-565. 2. Xie Z, Chen F, Li WA, et al. A review of sleep disorders and melatonin. Neurol Res. 2017;39(6):559-565. 3. Desan PH, Oren DA. Is seasonal affective disorder a disorder of circadian rhythms?. CNS Spectr. 2001;6(6):487-94, 499-501. Below we've broken down the main functions of our Melatonin 300 mcg and the benefits it can provide. Melatonin is a natural hormone produced by the pineal gland and released in the body at night to induce sleep. Taking melatonin has been shown to synchronize circadian rhythms. Research shows that melatonin may improve the onset, duration, and quality of sleep compared to a placebo. Research has found that seasonal depression might be linked to changes in circadian rhythm suggesting supplementation with melatonin may help lessen these symptoms.